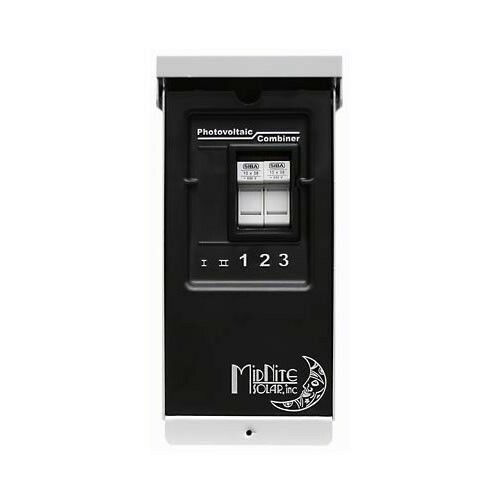 Click the button below to add the MNPV3 - MidNite Solar PV Combiner Box 3 Position to your wish list. What is a combiner box? The combiner box is basically an electrical box device that connects the input PV strings in parallel to produce one circuit. A combiner box is where array fuses and diodes can be mounted and also includes a negative bus bar and compression terminals where the positive wires from the array strings can be connected to the array fuses and diodes. Individual array strings can be parallel wired in the combiner box as well. Dimensions 10.5" x 4.5" x 3.5"